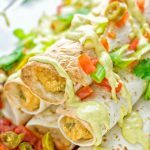 These amazingly mouthwatering Green Chili Enchiladas are super easy to make and packed with fantastic flavors. 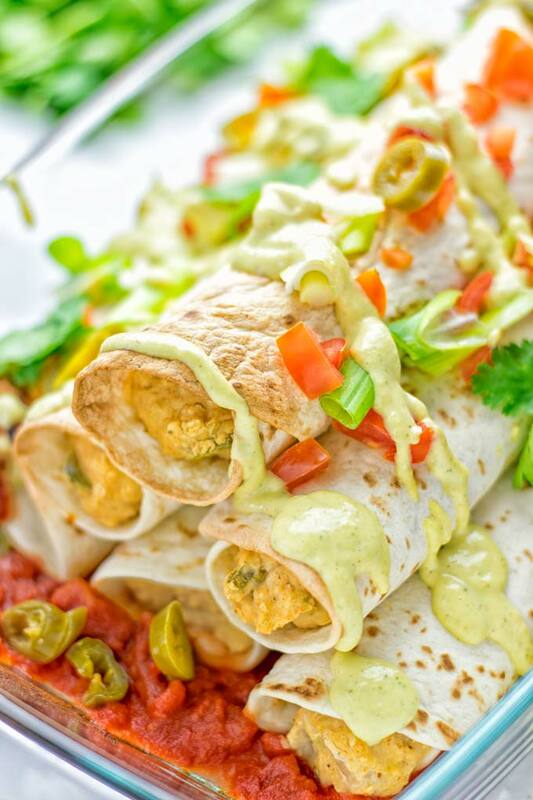 Entirely vegan, gluten free and a winning combination for everyone whose heart is big on Mexican inspired food. Mexican food is truly one of my favorites. I’m always into these flavors and deliciousness one can make and enjoy. Think of my Mexican Street Corn Potato Casserole or the Quinoa Taco Salad [vegan, gf]. Feel free to come on board for more delicious Mexican inspired food. Have fun to discover the search bar or browse the Mexican recipes list. 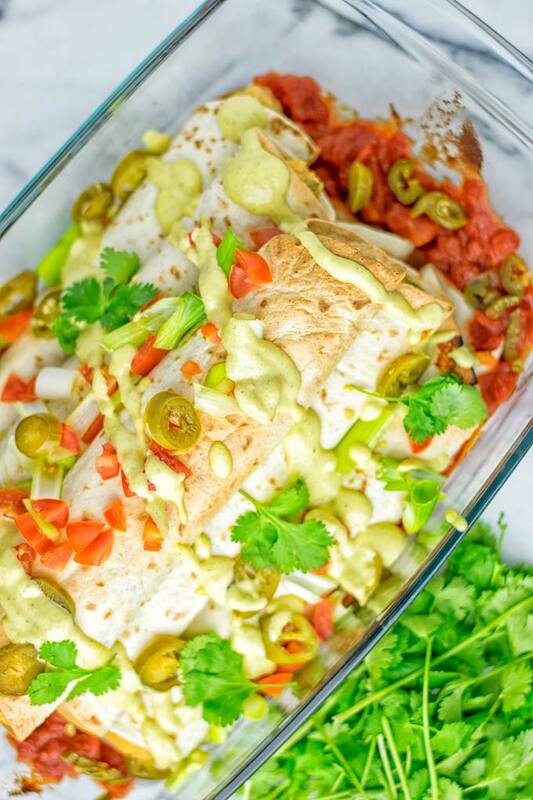 These Green Chili Enchiladas will not disappoint you and make your heart dancing. You will see these are spicy, creamy, flavorful, mouthwatering, perfectly seasoned from the inside out, hearty, crispy. And of course, filling, big, excellent, rolled and seriously delicious. 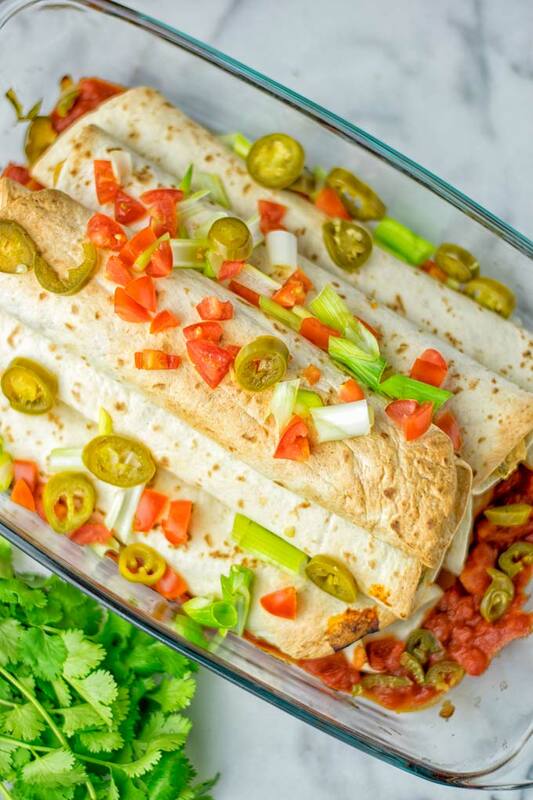 Basically an enchilada is a tortilla filled with some sauce, bean and cheese. You typically bake them in a casserole with some sauce. But that is only the basic idea. You can use what you want, or what you have on hand. We do a bean filling in this recipe, which is super delicious, perfectly spiced, filling, and on top of that protein rich. 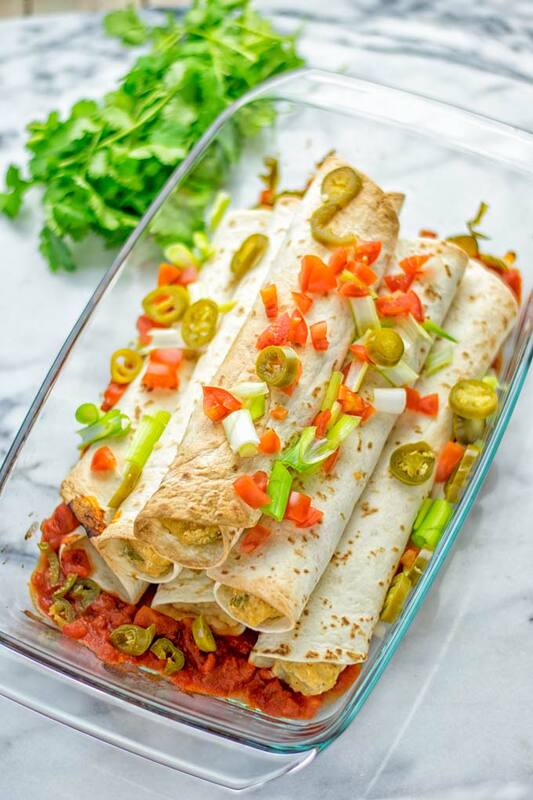 The beauty of enchiladas is that you can be creative with many fillings and tastes. 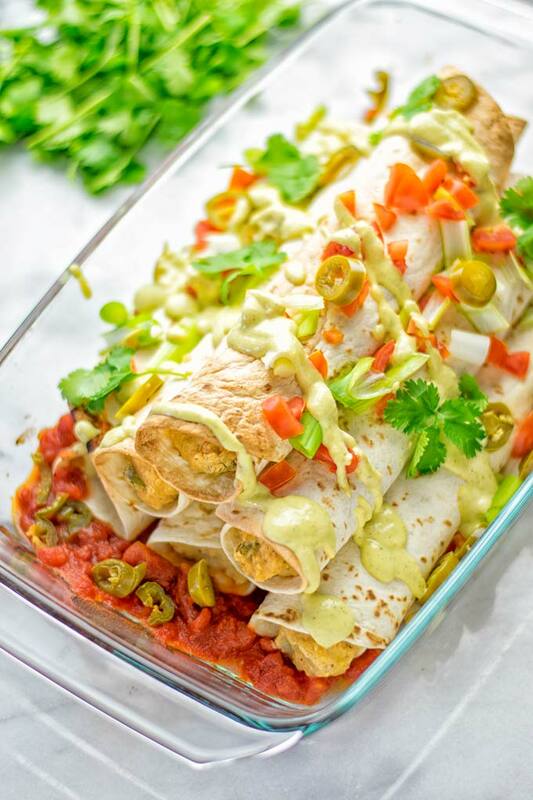 There aren’t any boundaries or limits when it comes to what goes in enchiladas. First hop over to a food processor. 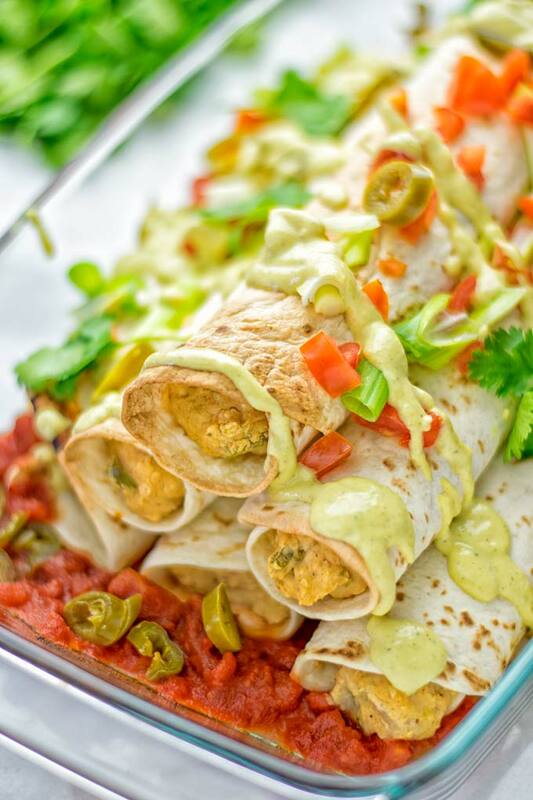 Combine garlic, vegan cream cheese, white beans, green chilis, optional enchilada seasoning, and nutritional yeast. Process until you have a creamy and thick mixture, but leave some texture. Don’t over-process, then set aside. Next step is making the 3 Ingredient Vegan Cheese Sauce. This time combine cashews, vegetable broth, and tahini in the bowl of a blender. A food processor will not be powerful enough. Process until smooth. Next and last assembling the enchiladas: grease a large casserole dish large enough to hold the rolled tortillas with a bit oil or vegetable broth. This will avoid that enchiladas get stuck to the casserole. Place 3 heaping Tbs of the filling onto the center of one tortilla. Roll and place in the casserole. You can brush the enchiladas with a olive oil or vegetable broth if you like, but there’s absolutely no need for. Repeat until all tortilla are filled. Bake at 430°F for 7 minutes at first. After this time sprinkle some 3 ingredient vegan cheese sauce on top and bake for around 9 minutes more. Use remaining sauce for serving. Serve on plates and enjoy. 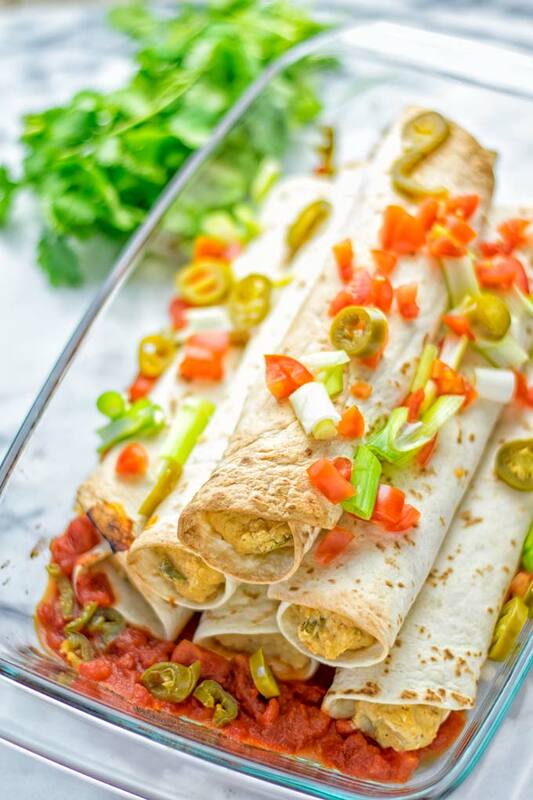 My Green Chili Enchiladas make a fantastic, lunch, dinner, meal preparation, and work lunch. So many options! If you plan this for meal preparation, I suggest to prepare everything including the sauce. Roll and prepare the enchiladas put them in the casserole. Keep them in fridge and bake them just before you’re going to eat them. Also you can do this in small batches. After preparing everything you can choose a small casserole and place enchiladas in it. So you have a lot for the whole week. They will stay fresh prepared for a couple of days. Note: use the sauce only before serving the enchiladas, during the baking, not from the start. Otherwise they will get soggy, and mushy and we want crispy and fresh ones. I find there is absolutely no need for something else. But if you want, you can serve this with a salad like this Southwest Quinoa Taco Salad or my Vegetarian White Chili. If you give these Green Chili Enchiladas a try tag me with a picture on Instagram and Facebook. Combine garlic, vegan cream cheese, white beans, green chilis, optional enchilada seasoning, and nutritional yeast in the bowl of a food processor. Process until you have a creamy and thick mixture, but leave some texture. Don’t over-process, then set aside. Prepare the 3 Ingredient Vegan Cheese Sauce by combining cashews, vegetable broth, and tahini in the bowl of a blender. A food processor will not be powerful enough. Process until smooth. 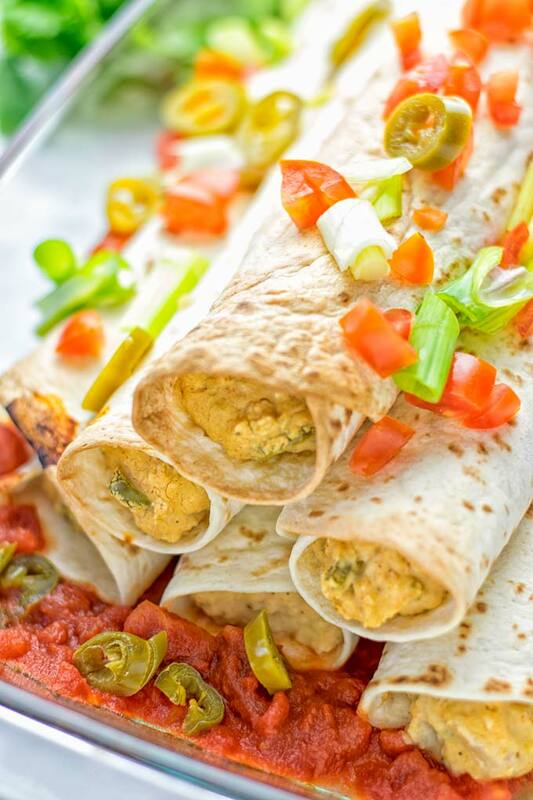 Grease a large casserole dish large enough to hold the rolled tortillas with a bit oil or vegetable broth. Place 3 heaping Tbs of the filling onto the center of one tortilla. Roll and place in the casserole. Repeat until all tortilla are filled. Bake at 430°F for 7 minutes at first. After this time sprinkle some 3 ingredient vegan cheese sauce on top and bake for around 9 minutes more. Use remaining sauce for serving. Serve on plates and enjoy.